Bigen Hair Color Professional Barber Showdown! 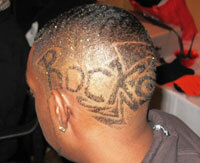 Check out highlights from the 2010 Barber Contest! Straight up. 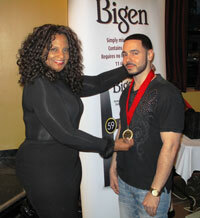 Bigen is the hair color brand for urban barbers specializing in African American hair and hair styles. So we are taking it on to find the top barber to show the world what he can do with our great product. But with so many slammin barbers to choose from, how are we going to find the best? Simple. Host a Barbershop Showdown. In 2012, Hoyu, the makers of Bigen Permanent Powder, will hit the streets of Atlanta, Detroit, Houston and Miami - Four cities known nationwide for producing some of the freshest hair styles out there. 4965 M.L. King Jr. Blvd. From our applicants, we find the ten hottest barbers from each city to show us what they've got in the semi-finals. First, second and third place cash prizes from $100 to $300 will be awarded at the semi finals, along with other great prizes. So you think you got what it takes? Then what are you waiting for?